Educate and entertain your child with one of the GazziliWorld learning apps for preschoolers. GazziliWorld apps are available for iPhone, iPad, and iPod Touch. As a part of LoveToKnow's writing team, GazziliWorld gave me - and my toddler - the opportunity to try out these apps for free on my iPhone. I am happy to report the results and detail each of these apps in this independent review. GazziliWords is filled with games designed to help young children understand words that can be difficult to explain. GazziliWords has been listed on iTunes Top 10 Educational Apps list and is a Webby Awards nominee. 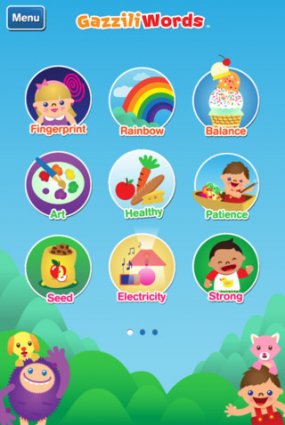 This app can be downloaded for free and contains three basic activities: Fingerprint, Rainbow and Balance. I liked that before each activity, there is a brief story explaining the activity. The narrator explains what the child is to do then gives encouragement throughout the activity until it is completed. This is motivating for children and keeps them interested in the task at hand. Fingerprint: Use your finger to touch dots on the screen to make a design out of fingerprints. Some designs are star, flower and happy face. Rainbow: For this activity, your child should know her colors as well as basic words. They should also know how to use a touch screen. This app teaches words, colors and even music. For an additional $0.99, you can download the GazziliWords Pack 2 which includes Art, Healthy and Patience in addition to the free activities. There is also GazziliWords Pack 3 that contains three more activities: Seed, Electricity and Strong. It also costs $0.99. GazziliShapes is teaches preschoolers various shapes. You will want your child to have a general understanding of shapes such as squares, triangles and circles to get the most out of this app. My son already knew his basic shapes, making this app great for him to use. This app is great for teaching kids about shapes that they may see around them, but is not the best app to introduce the concept of shapes. It costs $1.99 to download. Pizza: Find shapes to have the pizza delivered to the character. The narrator asks the child to tap the various shapes and gives encouragement and assistance. Once the child completes the activity, he is asked to identify the shapes found on a pizza. At the end of this app, the narrator reviews what shapes were found to reinforce learning. Cookies: Help the character make cookies by dragging shapes into a mixing bowl. The child should have basic knowledge of using a touch screen, as well as understand what items are specific shapes, to benefit from this feature. Necklace: This activity requires making a necklace out of various shapes such as octagons, triangles and circles. The child should have an understanding of numbers for this game since it requires specific numbers of shapes to make the design. It teaches both the concept of numbers and shapes. The GazziliPuzzles app costs $1.99 to download and is designed to teach problem solving and dexterity. GazziliPuzzles come to life once they are completed making it fun and rewarding for your child. You must first complete a puzzle to unlock the next one. Some puzzles in the app are Cowboy, Train, Skateboard, Sledding, Sea Park and Water Ski. The puzzles become more difficult as you advance through the stages. The first few are simple for a preschooler but the remaining ones may require an adult to help out. My son enjoyed the easier puzzles but got frustrated as they got more challenging. A child must be able to concentrate to get the most out of this app. There is also a Gazzili Fun Page where children can go once they complete all puzzles. The Fun Page features all the characters in action. There is not any interaction for the child at this point of the app. Instead, the Fun Page is designed to piece everything together at the end. Plants: Children can see how a plant grows from digging the hole to touching the stem to watch it grow. Sink or Float: This concept was new to my son and ended up being quite entertaining. Children will be surprised learning what items can sink versus what ones float in water. Gazzili apps are user-friendly and are all set up the same way. There is a home screen where your child can select his first activity. He is then sent on an adventure and must complete the first task to go on to the next one. There are a series of activities to complete for each app, with each activity more challenging than the one before it. Narration guides the child through the activity, offering support as well as encouragement. 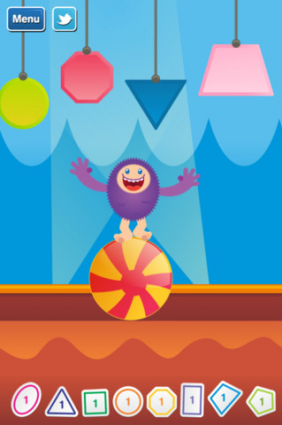 All the app options are done with bright colors and detailed artwork as well as music and sounds. These apps are hands-on and child friendly. Children will feel like they are playing games rather than learning. During the review, my son would actually ask me for my iPhone so he could play the games. He had no idea that he was learning while enjoying the GazziliWorld activities. While most of the apps I reviewed are not free, they are very inexpensive. The prices are fair for the quality of the app you receive, making the small fee well worth the entertainment and educational benefits to your child. I did notice that the GazziliWorld apps are large to download. I could not download them directly to my phone from the mobile app store. I had to first download them to my laptop using iTunes then sync them to my iPhone. Once I did this, they were all on my phone and ready for use. All of the GazziliWorld apps can be downloaded at the iTunes app store. The apps are compatible with iPhone, iPod Touch, and iPad and require iOS 3.1 or later. For more information, you can visit GazziliWorld.com and browse the various websites for each app. You can also follow GazziliWorld on Facebook and Twitter.